Another biggie literary event looms with the annoucement of the winner of the 2013 Pulitzer Prize for Literature due on Monday morning (American time). 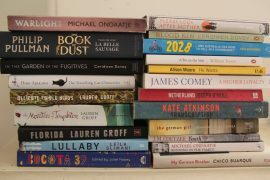 There was upraor last year when it was decided, for the first time in 35 years, not to award the prize at all, a huge slap in the face for what many thought was a very impressive year in both fiction and non-fiction. There has been very little buzz around about who is in the running although we can be sure about a couple of people who definitely won’t be the winner. Multi-award winners Hilary Mantel (Bring Up The Bodies), Alice Munro (Dear Life) and Zadie Smith (NW) are all ineligible because they are not American. My short, short-list is Kevin Power’s for his almost poetic novel about a young soldier at war, The Yellow Birds, Louise Erdrich’s The Round House, a fine literary thriller set on a North Dakota Reservation and the absolutely riveting Beautiful Ruins by Jess Harper. The first two have been reviewed on stillnotfussed and the review of Beautiful Ruins will be posted shortly.